La Canada Flintridge, Californie, U.S. 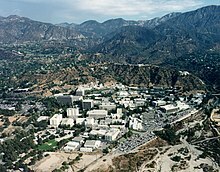 The Jet Propulsion Laboratory (JPL) is a federally funeit research an development centre an NASA field centre locatit in La Cañada Flintridge, Californie an Pasadena, Californie, Unitit States. This page wis last eeditit on 10 Julie 2016, at 14:57.